Transistor is an action role-playing video game developed and published by Supergiant Games. The game was released in May 2014 for Microsoft Windows and PlayStation 4, and for OS X and Linux in October 2014, and iOS devices in June 2015. Transistor sold over one million copies across all platforms by December 2015. Transistor utilizes an isometric point of view. The player controls the character Red as she travels through a series of locations, battling enemies known collectively as the Process in both real-time combat and a frozen planning mode referred to as "Turn()". Using Turn() drains the action bar, which refills after a short delay. Until it is full again, Red cannot use Turn(), or any other power (without a specific upgrade). Red earns experience points after each battle, and may collect new powers (called Functions) from fallen victims of the Process. Functions may be equipped as one of four unique techniques, as an enhancement on another, equipped technique, or as a passive, persistent effect during battle. For example, the Function Spark() may be used to fire a wide area attack, equipped on another Function to increase its area of effect, or used as a passive effect to spawn decoys of Red. Red can also collect and activate Limiters, which serve as optional debuffs during combat, but in turn increase experience gained. Both Functions and Limiters reveal minor parts of the story if used for a long enough time. For the PlayStation 4 version, the DualShock 4 light bar flashes in sync with the Transistor's speech. In June 2015, the game was released on the iOS App Store with default tap controls configured for the iPhone and iPad touchscreens. In addition, the iOS version of the game includes optional gamepad support. In November 2015, the game was released for the Apple TV and is compatible with the Siri Remote. Red, a famous singer in a city called Cloudbank, is attacked by the Process, a robotic force commanded by a group called the Camerata. She manages to escape and comes into possession of the mysterious Transistor—the great sword-like weapon she was to be assassinated with. The Transistor is buried into the chest of a man, now slumped over and dead; though his consciousness and voice seem to have been absorbed into the Transistor itself along with Red's voice. The Camerata continue to track Red and the Transistor down with the Process, wanting the weapon for some yet-unknown cause. The game opens with the player character, Red, kneeling by the body of an unknown man who has been killed with a glowing great sword—the titular Transistor. Red is a singer, and the attack which killed the man has also stolen her voice, sealing it inside the Transistor. The dead man's consciousness has also been absorbed into the sword, and through it, he is able to speak to Red and act as the game's narrator. As Red makes her way out of the district in which the game starts, she comes into conflict with an army of robotic intelligence known as the Process. Red makes her way to her former performance stage, in Cloudbank's Goldwalk district, where it is revealed that the Process is being controlled by the Camerata, a sinister group of high-ranking officials. They were the ones who attacked Red, though the attack was thwarted when the man in the Transistor stepped in front of the blow. As Red travels, she discovers several Cloudbank citizens who have been "integrated" by the Process and absorbs their trace data into the Transistor, expanding the weapon's functionality. Upon reaching the stage where she performed that night, Red encounters Sybil Reisz, the Camerata member who had befriended her before the assassination attempt, in a corrupted Process-like form. It is revealed that Sybil was in love with Red, and that she arranged for the attack in an attempt to cause the man's death and have Red to herself. After defeating Sybil and absorbing her consciousness into the Transistor, Red uses Sybil's knowledge of the Camerata to locate their leader—one of the administrators of Cloudbank, Grant Kendrell. As Red enters the Highrise district, the Process becomes more aggressive in their actions, attacking the entire city; this leads to the Process becoming public knowledge. Asher Kendrell, another member of the Camerata, publicly apologizes for the Camerata's actions and reveals their involvement in the Process invasion, going so far as to contact and apologize to Red for all that the Camerata has done to her, the mysterious man in the Transistor, and the dozens of other influential figures who have been Processed and destroyed. It becomes apparent that the Camerata are no longer in control of the Process, and that the current situation is very different from their intended vision. After fighting past numerous Process enemies, including a massive creature referred to as the "Spine" whose mere presence severely affects the man in the Transistor, Red reaches the hideout of the Camerata in Bracket Towers only to find that Grant and Asher have committed suicide. After resolving to hunt down the final member of the Camerata, Royce Bracket, and then escape the city, Red and her companion find themselves traveling back through the starting portion of the game which has now been "Processed" into a blocky, white facsimile of its original form. Upon reaching the starting point of the game, Royce approaches Red through a robotic proxy and offers a truce in order for them to work together to stop the Process. Royce reveals that the Transistor is a "remote-control" to manipulate the changing landscape and environment of Cloudbank. It is the central part of the apparatus used by the city's administrators, including the late Grant, to change the city to fit the whims of the people. After fighting through the completely Processed district of Fairview, in which the Process has evolved a humanoid form and the laws of physics only loosely apply, Red arrives at the Cradle, the system that the Transistor powers in order to manipulate the Process—which is suggested to be an integral part of the system to rearrange and change Cloudbank—and stop the invasion. After Red places the Transistor in the Cradle, she and Royce are absorbed into it. In the Transistor's virtual realm, now armed with a Transistor of his own, Royce informs Red that only one of them can escape back to Cloudbank and repair the city. He apologizes to Red for this and the two clash. After defeating Royce, leaving him trapped inside the Transistor-world, Red is transported back into Cloudbank, where she begins the task of rebuilding Cloudbank's Processed areas. Upon un-processing the mysterious man's body and learning he cannot be restored from inside the Transistor, she sits down beside him and—despite his protests and pleadings otherwise—impales herself with the Transistor, committing suicide. In the closing credits sequence, it is shown that the man is reunited with Red within the virtual world of the Transistor. At this moment, a heartfelt embrace reveals that her voice has also been restored. Transistor's soundtrack was written and produced by Darren Korb. It was released simultaneously with the game on May 20, 2014. Ashley Lynn Barrett, who was the female vocalist in Bastion's soundtrack, returned to provide vocals for "The Spine", "In Circles", "We All Become", "Signals", and "Paper Boats". The musical style of the soundtrack has been described by Korb as "old-world electronic post-rock". To fit that genre of music, the instruments used includes electric guitars, harps, accordions, mandolins, electric piano, and synth pads. Additionally, an EQ filter is overlaid over the music during the pause and "TURN()" menus to have a distant, blurred sound. The soundtrack sold 48,000 copies within the first ten days of release. On November 2, 2015 to commemorate Transistor's release on Apple TV, a new bonus track written and produced by Darren Korb, "She Shines" was added to the soundtrack. Ashley Barrett returned to provide the vocals. Transistor has been well received by game critics; receiving an 8/10 from GameSpot, 8.5/10 from Destructoid, 9/10 from IGN, and an 8.5/10 from Polygon. It also has an 83 out of 100 on review aggregator Metacritic based on 57 reviews for PlayStation 4 and 35 reviews for Microsoft Windows, indicating "generally favorable reviews". The game’s visuals and soundtrack have been praised by reviewers. Richard Niak of Game Critics wrote that the aesthetics of Cloudbank, the game’s main setting are, “...a key factor in understanding the story and the destruction being wrought by the Process.”  Randy Kalista of Gaming Nexus called the soundtrack “an indispensable element of Transistor’s storytelling.”  Danielle Riendeau of Polygon wrote that Transistor is, “...oozing with style and aesthetic charm,” and that the music and voice. “Set it apart aesthetically,” and infuse the game with personality and life. As of January 2015, the game has sold 600,000 copies. By December 2015, the game had surpassed one million copies sold and had received over 100 industry accolades and awards. ^ Kasavin, Greg (April 10, 2014). "Transistor arrives May 20 on PS4 and PC". Supergiant Games. Retrieved April 10, 2014. ^ Kasavin, Greg (October 30, 2014). "Transistor Out Now on Mac and Linux!". Supergiant Games. Retrieved October 31, 2014. ^ Scalzo, John (June 11, 2015). "Supergiant's Transistor is now available on iOS App Store". Warp Zoned. Retrieved June 24, 2015. ^ a b "Supergiant Games - Happy Holidays from Supergiant!". www.supergiantgames.com. Retrieved 2017-04-18. ^ Duncan, Alasdair (March 22, 2013). "PAX: Transistor is a worthy follow-up to Bastion". Destructoid. Retrieved May 20, 2014. ^ Kasavin, Greg (May 6, 2014). "Transistor Preorder & Soundtrack". Supergiant Games. Retrieved May 20, 2014. ^ a b Priestman, Chris (June 11, 2015). "Transistor, the stylish sci-fi action-RPG from the Bastion dev, is out now on iOS". Pocket Gamer. Retrieved June 24, 2015. ^ Nelson, Jared (June 12, 2015). "TouchArcade Game of the Week: 'Transistor'". TouchArcade. Retrieved June 24, 2015. ^ a b Podgorski, Daniel (May 4, 2016). "Red Pen: On the Interestingly Deep yet Frustratingly Vague Plot of Supergiant Games' Transistor". The Gemsbok. Retrieved February 6, 2017. ^ "Transistor Original Soundtrack". Bandcamp. Supergiant Games. Retrieved June 5, 2014. ^ Korb, Darren (May 23, 2014). "Behind the Music and Sounds of Transistor". PlayStation Blog. Sony Computer Entertainment. Retrieved June 3, 2014. ^ John Aidan, Byrne (June 7, 2014). "Wall Street exec moonlights as manager for indie rockers". New York Post. Retrieved June 11, 2014. ^ Greg, Kasavin (November 2, 2015). "Out Now: Transistor for the New Apple TV!". Supergiant Games. ^ a b "Transistor for PlayStation 4 Reviews". Metacritic. CBS Interactive. Retrieved May 23, 2014. ^ a b "Transistor for PC Reviews". Metacritic. CBS Interactive. Retrieved May 23, 2014. ^ "Transistor for iPhone/iPad Reviews". Metacritic. CBS Interactive. Retrieved June 23, 2018. ^ a b Duncan, Alasdair (May 20, 2014). "Review: Transistor". Destructoid. Retrieved May 20, 2014. ^ a b Miller, Matt (May 20, 2014). "Transistor: Weird And Wonderful Discovery". Game Informer. Retrieved May 20, 2014. ^ a b Petit, Carolyn (May 20, 2014). "Transistor Review". GameSpot. Retrieved May 20, 2014. ^ a b c Sliva, Marty (May 20, 2014). 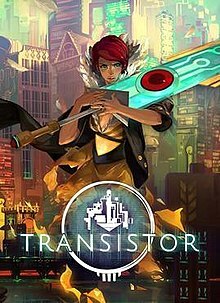 "Transistor Review". IGN. Retrieved May 20, 2014. ^ a b c d Riendeau, Danielle (May 20, 2014). "Transistor Review: A Girl and Her Sword". Polygon. Retrieved May 20, 2014. ^ Lazarides, Tasos (June 19, 2015). "'Transistor' Review – An Action-Packed, Evocative Journey in an Amazing World". TouchArcade. Retrieved June 23, 2018. ^ LeJacq, Yannick (May 20, 2014). "Transistor: The Kotaku Review". Kotaku. Retrieved May 20, 2014. ^ "Transistor Review – GameCritics.com". gamecritics.com. Retrieved 2017-04-18. ^ "Transistor - Gaming Nexus". Gaming Nexus. Retrieved 2017-04-18. ^ Donlan, Christian (2014-05-20). "Transistor review". Eurogamer. Retrieved 2017-04-18. ^ "Transistor (PC) Review - Walk Softly and Carry a Talking Sword - COGconnected". COGconnected. Retrieved 2017-04-18. ^ "Transistor". DarkStation. Retrieved 2017-04-18. ^ S, Matt. "Review: Transistor (PC)". www.digitallydownloaded.net. Retrieved 2017-04-18. ^ Makuch, Eddie (2015-01-09). "Bastion Sells 3 Million, Transistor Hits 600,000". GameSpot. CBS Interactive. Archived from the original on 2015-01-10. Retrieved 2015-01-09. ^ a b "Supergiant Games - Transistor Earns 100+ Industry Accolades, Sells More Than 600k Copies". www.supergiantgames.com. Retrieved 2017-04-18. ^ "Nominees - Game Awards 2014". The Game Awards. Archived from the original on November 14, 2015. Retrieved December 6, 2014. ^ Kain, Erik (December 6, 2014). "All The Winners Of The 2014 Game Awards". Forbes. Archived from the original on December 14, 2014. Retrieved December 14, 2014. ^ "Giant Bomb's 2014 Game of the Year Awards: Day Two Text Recap". Giant Bomb. CBS Interactive. December 27, 2014. Archived from the original on December 28, 2014. Retrieved December 28, 2014. ^ "Winner: Best Graphics - Art". IGN. Ziff Davis. January 13, 2015. Archived from the original on February 12, 2015. Retrieved February 12, 2015. ^ "Best Music". IGN. Ziff Davis. January 13, 2015. Archived from the original on February 12, 2015. Retrieved February 12, 2015. ^ "Best Overall Game". IGN. Ziff Davis. January 13, 2015. Archived from the original on February 12, 2015. Retrieved February 12, 2015. ^ "Best PS4 Game". IGN. Ziff Davis. January 13, 2015. Archived from the original on February 12, 2015. Retrieved February 12, 2015. ^ "Best Sound Design". IGN. Ziff Davis. January 13, 2015. Archived from the original on February 12, 2015. Retrieved February 12, 2015. ^ "Best Strategy". IGN. Ziff Davis. January 13, 2015. Archived from the original on December 18, 2014. Retrieved February 12, 2015. ^ "Academy of Interactive Arts & Sciences D.I.C.E. Awards 2015". Retrieved April 15, 2017. ^ "Game Developers Choice Awards". www.gamechoiceawards.com. Retrieved 2017-04-15. ^ "Games in 2015 | BAFTA Awards". awards.bafta.org. Retrieved 2017-04-15. ^ "Second Annual SXSW Gaming Awards Announces Top Winners in 21 Categories" (PDF). Retrieved 18 April 2017. This page was last edited on 21 April 2019, at 04:56 (UTC).